At the Coral Lagoon Lodge we offer a full day outing service for those wishing to visit us for the day and all inclusive accommodation services for those that just don’t want to leave! For all our guests with us we offer land and sea transfers from the Eco-Lodge, deck chairs with umbrellas, beach towels and hammocks under the mangroves’ shade, for those that just want to disconnect from it all, as well as kayaks and snorkeling gear to help you explore the surrounding reefs and mangroves! We also offer an open bar and from our dining area you’ll enjoy Oskar’s famed culinary creations while contemplating the views of the bay and the surrounding mountains of the Henri Pittier National Park. 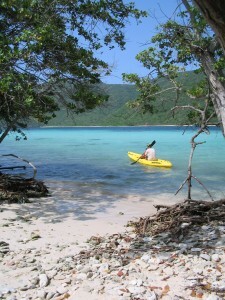 Enjoy spending your whole day snorkeling, kayaking or just swinging in the hammock on the waters edge. Our full day Includes: Fresh fish lunch, open bar, deck chairs, beach towels, kayaks, snorkeling gear, land-sea transfers from the Eco-Lodge and the undivided attentions of Oskar your host and Chef! Enjoy spending two or more days snorkeling, kayaking and relaxing in the hammocks on the water’s edge. Staying over lets you enjoy the spectacular Cienaga sunsets from the comfort of your hammock or deck chair whilst enjoying the evenings drinks. For the little ones there is a world of fun learning how to fish and exploring the shoreline and nearby docks for the marine life that comes out at night. The 2 day 1 night stay include: two lunches, one dinner, one breakfast, open bar, deck chairs, beach towels, kayaks, snorkeling gear, land-sea transfers from the Eco-Lodge and the opportunity to enjoy more than one of Oskar’s culinary creations! Note on Meals: Located on the waters edge we serve mostly fish and seafood dishes for lunch and a varied menu in the evenings. Should you have any special requests for vegan or vegetarian meals or would like us to include or exclude any particular ingredients, please do let us know in advance and we will be happy to accommodate you ! For certified divers and first timers wishing to do a discovery dive. Our third party certified SSI and PADI instructors will take you to explore some of the best Venezuela diving! Only available through advance booking and subject to guide availability. Content © 2010 Inversiones Hotel Eco-Lodge CA - Venezuela. All Rights Reserved. Website design & hosting by Visual Edge Design.